Spinal muscular atrophy (SMA) is a progressive motor neuron disease caused by deleterious variants in SMN1 that lead to a marked decrease in survival motor neuron (SMN) protein expression. Humans have a second SMN gene (SMN2) that is almost identical to SMN1. However, due to alternative splicing the majority of SMN2 messenger ribonucleic acid (mRNA) is translated into a truncated, unstable protein that is quickly degraded. Because the presence of SMN2 provides a unique opportunity for therapy development in SMA patients, the mechanisms that regulate SMN2 splicing and mRNA expression have been elucidated in great detail. In contrast, how much SMN protein is produced at different developmental time points and in different tissues remains under-characterized. In this study, we addressed this issue by determining SMN protein expression levels at three developmental time points across six different mouse tissues and in two distinct mouse models of SMA ('severe' Taiwanese and 'intermediate' Smn2B/mice). We found that, in healthy control mice, SMN protein expression was significantly influenced by both age and tissue type.When comparing mouse models of SMA, we found that, despite being transcribed from genetically different alleles, control SMN levels were relatively similar. In contrast, the degree of SMN depletion between tissues in SMA varied substantially over time and between the two models. 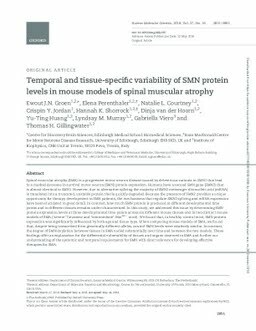 These findings offer an explanation for the differential vulnerability of tissues and organs observed in SMA and further our understanding of the systemic and temporal requirements for SMN with direct relevance for developing effective therapies for SMA.